Our wooden partitions provide a stylish and convenient way to manage the use of space within offices, golf clubs or care homes where sound proofing isn’t the main consideration. The timber panels are finished melamine and are available in a limited range of finishes. The narrow panels mean neat stacking when not in use and easy operation ensures minimal fuss when changing the space to accommodate a different use. The flexibility of this type of partition also makes it the perfect choice for use at home in kitchens, bathrooms, attic conversions and conservatories or as a room divider in large family living spaces. For further information and advice on installing a wooden partition call one of our team on 01373 454577 or request a quote via our online form. If you are wanting to install your folding doors or Bi Fold Doors yourself then watch our video with DIY Doctor with step by step guidance. Watch our Installation Video made with the DIY Doctors if you would like to install your folding doors yourself. The warmth and flexibility of our wood finished partitions has seen them used in a wide range of interiors around the UK. In the health sector wooden folding partitions have been used to provide temporary division between departments at several hospitals including the York Health Services NHS Trust and The Medical Centre in West London. They are also a popular choice for golf and country clubs. On Anglesey at the Bull Bay Golf Club, and in Swindon at the Wrag Barn Golf and Country Club where the folding partitions have been used to separate the restaurant from the bar area, yet when folded back, providing a completely open function room for other purposes. Another practical application is the use of a wood partition system to provide a separate shop or retail outlet within a larger space such as a museum or theatre. The partition can be closed and locked when the shop is not in operation protecting the merchandise and then quickly and easily folded away to enable visitors to use the shop during visiting hours. Our wood partition doors are built to last with a core of solid fibre board covered in a choice of three finishes, White, Oak and Beech. Strong and robust, sitting firmly in the frame, they are built to last using the best materials and components. 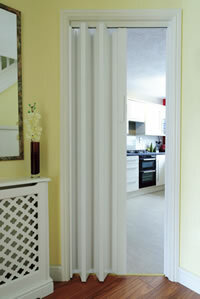 All doors have a high quality, scratch and moisture resistant finish. As they are designed for the DIY market, fitting times are less than 1 hr and they are maintenance free. There are vision panel options available with either frosted or clear acrylic as a safety feature. Standard handles are available in the same colour finish as the partition doors although other handle options are available if required as an optional extra. 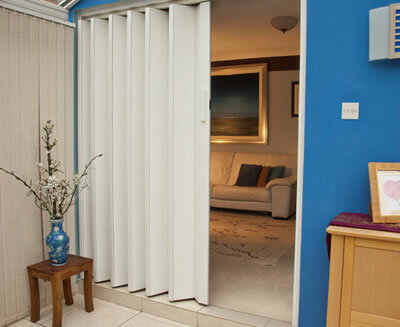 Partition doors are made to measure and are available to a maximum height of 3000mm. Our wood partitions come in white, oak or beech finish to match any colour scheme or decor.